News reports and Tweets from Qaraqosh, Iraq, the largest Christian city in that country located near Mosul, all say “liberated,” but the simple truth is that the Islamic State was driven from the city last week by Christian soldiers. The terrorist organization is still in the region, and in their wake, they leave behind a mess. This destruction is bad enough, though it is not total. 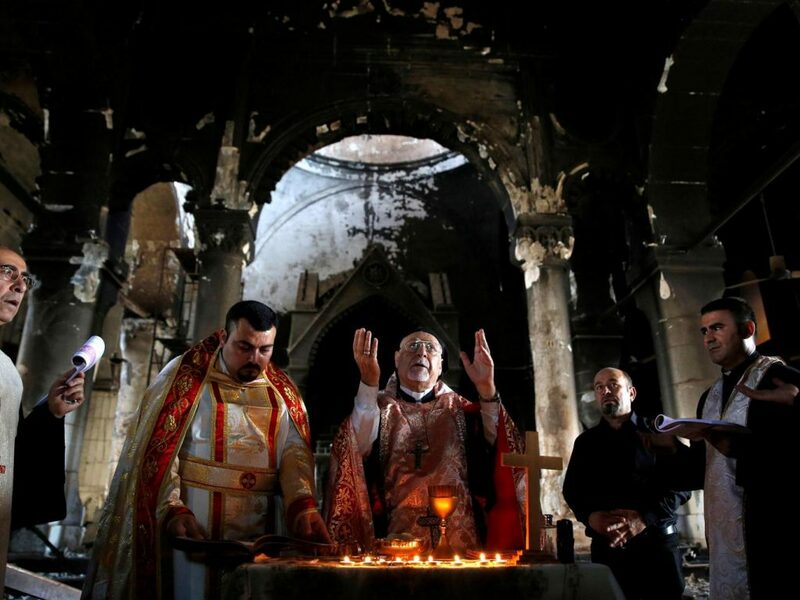 Isis fighters set fire to many ordinary houses in addition to the churches in the days before they left, but – possibly because there was no furniture left to burn since it all had been looted – most of these houses look as if they could be made habitable after extensive repairs. It will take time because not only has the furniture gone, but cookers and fridges so, even if light fittings or taps are still in place, there is no water or electricity. 28,000 people call Qaraqosh home. 40,000 fled to safer locales in Europe and Asia Minor. 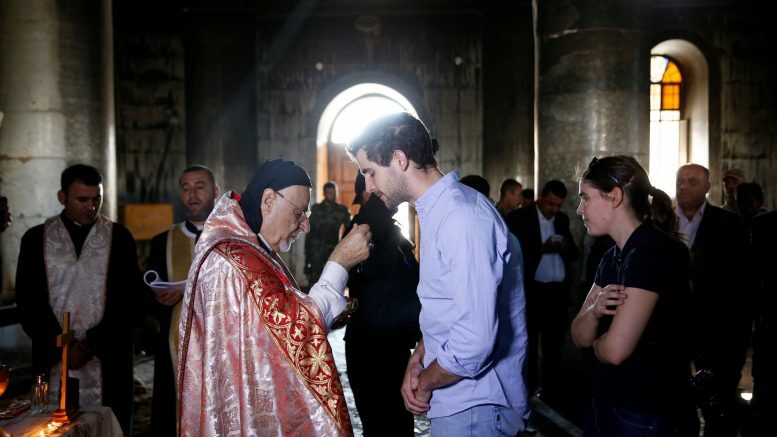 As a result, there are still Christian in the region – largely Syriac Catholics, one of the eastern rites (most of the west uses the Latin Rite) – and the first thing they did was celebrate Mass in the Church of the Immaculate Conception for the first time in over two years. War still rages in the region, and not even fifty miles away, the battle is still being fought, thus giving credence to the insecurity of the residents. In addition, they have a message for America on the eve of the election. IRAQI Christians will pray for Donald Trump’s election victory after they condemned US Government for “abandoning” them to the barbaric terror of Islamic State. The Christian community in the latest Iraqi town to be freed from ISIS have opened up about how they were terrorised at the hands of the twisted jihadi militants. The once-bustling Qaraqosh, which boasted of more than 50,000 Christian residents, was recaptured from the jihadis last week. …Those who survived the terror have now voiced their outrage that President Obama refused to protect them when Iraq’s largest Christian city fell to ISIS more than two years ago. A man in the village said he hopes Donald Trump – a widely favoured candidate in the town – will bring a different approach to Iraqi Christians. He told the camera: “Obama has never helped the Christians. In fact, he despises them. In the last 26 months, he has shown he despises all of them. Let’s just hope the Deplorables who make up the monster vote can beat out the election rigging. For more images, and a video of the return of chant to the church that so obviously sustained heavy damage during the ISIS occupation of Christian lands, please visit the Gateway Pundit. 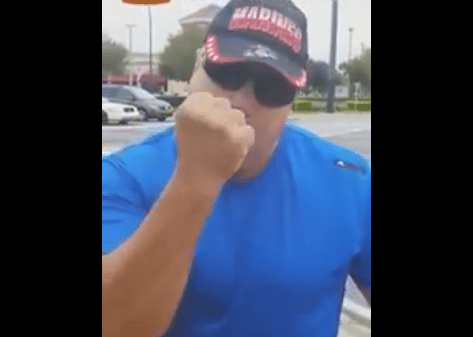 Black Lives Matter Protesters Harass Marine with a “Police Lives Matter” Sign…Big Mistake!